With a population of around nine million, Austria is a landlocked country in the heart of Europe, bordering Germany, the Czech Republic, Slovakia, Hungary, Slovenia, Italy, Switzerland and Liechtenstein. 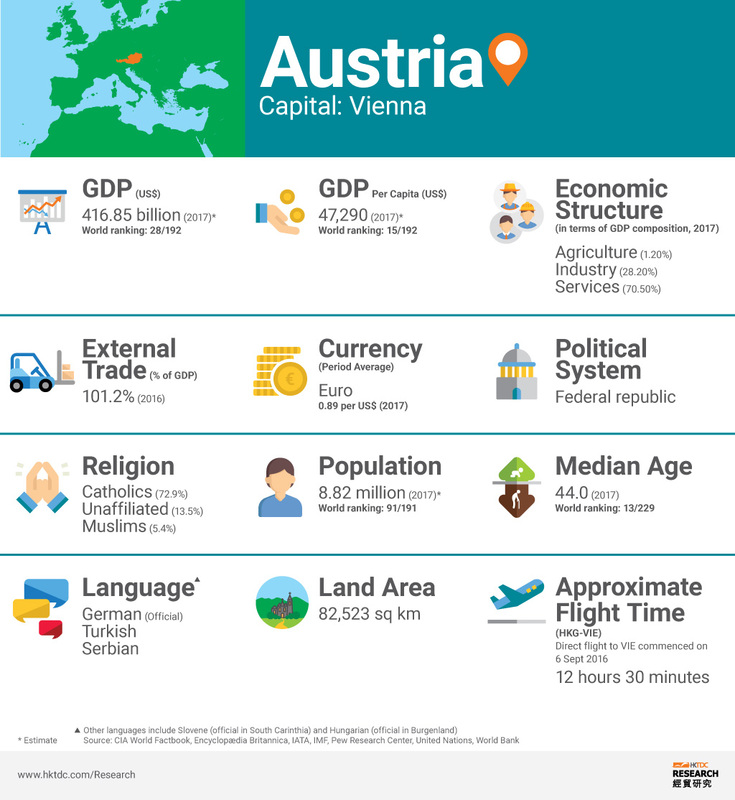 Known for its political and economic stability, Austria is one of the richest countries in the world, enjoying a per-capita GDP of more than US$47,000. Austria joined the EU on 1 January 1995 and, subsequently, adopted the Euro in place of the Austrian Schilling in January 2002, a move that further integrated its economy with that of other EU member countries. Its EU membership has also helped the country attract an influx of overseas investors, all keen to capitalise on Austria’s access to the single European market and its proximity to the new EU member states in Central and Eastern Europe (CEE). Austria’s geographic location and the EU’s eastward expansion make it the ideal base for those looking to do business in Eastern and South-Eastern Europe. Home to a total of more than 300 regional headquarters (RHQs) – including nearly 30 Fortune 500 firms – the country is by far outperforming many of its CEE competitors, notably Poland, Slovakia, the Czech Republic and Hungary, in this regard. Among the companies to have opted for an Austrian base are Eli Lilly (pharmaceutical), Siemens, Henkel (home and beauty care) and FedEx. In addition, approximately 40 CEE-related international institutions are based in Austria. Among the key sectors of Austrian industry likely to appeal to overseas investors are automotive, chemicals, electronics, environmental technologies, IT, life sciences, logistics, mechanical engineering, mechatronics (a fusion of machine construction, electronics and information technology) and tourism. In order to facilitate foreign investment, Austria offers a broad spectrum of incentives, grants and subsidies, all designed to assist small and medium-sized enterprises, support research and development and nurture start-ups via a range of investment and technological promotional measures. The form of funding available ranges from cash grants and interest subsidies to loan guarantees. More information on the investment environment and the relevant regulations can be found at ABA - Invest in Austria. According to the Central Bank of Austria (OeNB), China’s total stock of FDI in Austria amounted to US$773 million as of the end of 2017, a considerable increase on the US$163 million recorded in 2009. With an Austrian FDI level of US$3 billion as of the end of 2017, Hong Kong, however, was the largest Asian investor in the country overall. As an important step in accommodating greater synergies, Hong Kong and Austria signed a Comprehensive Agreement for the Avoidance of Double Taxation (CDTA) on 25 May 2010, which then came into force on 1 January 2011. This is in addition to the Investment Promotion and Protection Agreement (IPPA) that came into force on 1 October 1997.